By offering a wide choice of materials and heat treatments for rolling bearings, performance and operating life can be optimised, even for the most demanding industrial applications, says Dr Steve Lacey, Engineering Manager at Schaeffler UK. In recent years, there has been a significant increase in the demand for rolling bearings that, even under extreme operating conditions – including lubricant starvation, highly corrosive or high temperature environments – still provide a long operating life and optimum performance. But selecting a suitable material or heat treatment process for rolling bearings often requires expert advice and guidance, normally from the manufacturer of the bearings. Selection depends on the application itself and the specific environment in which the bearings will operate. This means a number of factors require careful consideration, such as the mechanical, chemical and thermal requirements placed on the bearings, as well as lubrication conditions, particularly if the application requires dry running bearings. There is a key role here for the type of materials used for the various bearing components (i.e. rings, rolling elements, cage, etc.) and how these interact. 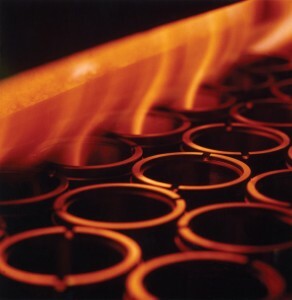 Some of these materials are industry-recognised standard steels (in rolling bearing quality), but others may need to be specially developed by the manufacturer or might involve special surface or heat treatment processes to give the material a certain set of characteristics that are deemed critical for a certain application. For most industrial applications, standard through hardened rolling bearing steel (100Cr6) is sufficient. This versatile material is heat treated (martensitic-hardened and tempered at low temperatures), which provides consistently high hardness (between 62 and 64 HRC) distributed over the circumference and cross-section. The main attributes of this material are high hardness and wear resistance, as well as good resistance to over-rolling (solid particles can produce surface indentations of raceways in rolling-sliding lubricated contacts). Depending on the wall thickness of the components, it may be necessary to use a higher-grade alloy taking account of hardenability. The material also permits operating temperatures up to 120 deg C, with some grades offering up to 200 deg C. Typical applications include small combustion engines and fan bearings for steel mills. A slight variation on the above is bainitic hardened 100Cr6 steel. With this material, there is a considerable reduction in the risk of crack formation, even with surface damage. Typical applications for these bearings include wheelset bearings for bucket wheel excavators and trams. Case hardened steel (St4) in rolling bearing quality has good forming characteristics and provides high hardness and wear resistance, as well as good resistance to over-rolling. This material is well suited to small components that are manufactured in high volumes, such as universal joints, drawn cup needle roller bearings with closed ends and swing arm bearings. If there is a high risk of particle over-rolling and poor lubricating conditions (e.g. refrigerating compressors, gearbox bearings for construction/agricultural machinery), carbonitrided steel (100CrMnSi6-4) is the preferred choice. This material is heat treated to provide excellent dimensional stability and hardness up to 66 HRC in the outer functional layer by using increased residual austenite content. The result is a material that provides higher resistance to surface damage and high wear resistance, leading to extended bearing life in poor lubrication conditions, especially where there is a high risk of contamination. Used primarily for medium and large sized rolling bearings, including wind turbine main rotor bearings and wheelset bearings for heavy-duty trucks, case hardened (carburised and martensitic hardened) steel offers hardness up to 64 HRC in the form of a hard surface layer with a tough core. This treatment provides residual compressive stresses in the surface layer, providing increased fracture resistance under shock type loads or surface damage, as well as reduced crack formation with surface damage. Nitrogen alloyed chromium steel (e.g. Schaeffler’s Cronidur® 30) is a material that is martensitic hardened and tempered at low (or possibly high) temperature. This material provides excellent corrosion resistance, particularly against aggressive chemicals and acids. Operating temperatures are typically up to 150 deg C. Main areas of application are bearings that are subjected to high loads, lubricant starvation, dry running, media lubrication and corrosive environments. Examples include spindle bearings for machine tools and bearings for process pumps. Corrosion resistant, case hardened steel (surface layer nitriding) provides rolling bearings with even better resistance to corrosion and significantly improves resistance to over-rolling. Schaeffler’s Cronitect® steel, for example, has found numerous applications in food processing (e.g. bottle filling plants), as well as in sports and fitness applications (e.g. inline roller skates and gym equipment). Often bearings manufacturers are required to provide special materials and heat treatments for certain applications or industry sectors. The aerospace sector, for example, specifies M50 steel (martensitic hardened) for many applications such as main shaft bearings and turbine rotor bearings on aircraft engines. This material provides excellent thermal stability (up to 400 deg C) and increased toughness, even at high bearing operating speeds. Offering even higher hardness (up to 70 HRC) are duplex hardened M50NiL steels. These are used if the bearings are subjected to high loads, very high rotational speeds and if a high tolerance to damage is required. Where current insulation and high wear resistance are important considerations, oxide-based ceramics (e.g. zirconium oxide ZrO2) are ideal. These sintered materials can be used in temperatures up to 600 deg C, with typical hardness ratings in the region of 1400 HV and a density between Si3N4 and steel. The material is normally only used for the rolling elements that are in contact with steel-based bearing rings. Main areas of application are where the bearings are subjected to low loads (hybrid bearings), lubricant starvation, dry running, media lubrication and corrosive environments (e.g. electric motors for car windows). In certain food processing applications and for machine tool spindle bearings, silicon nitride-based ceramic rolling elements can be specified. The technical advantages of this material include its reduced mass and ability to withstand higher operating temperatures (up to 700 deg C), as well as high speed capacity, current insulation, very high wear resistance, reduced friction and increased grease operating life. Steel rolling mill bearings and some marine propulsion systems use case hardened rolling bearing steel (to DIN EN 10084). Examples here include 17MnCr5 and 17CrNiMo7-6. These materials are specified if the bearings are subjected to high loads combined with poor lubrication and when there is a high risk of particle over-rolling. For more information, please call Schaeffler UK’s Marketing Department on 0121 313 5870. Alternatively, email info.uk@schaeffler.com.